Where OS X and Linux are competing for second place behind Windows, this will clearly move Linux to the #2 spot and relegate the Mac to third place. And manufacturers are ramping up in hopes of shipping samples by the end of November, production machines in 2007. In other news, MCE lets power users put a second hard drive in their G4 PowerBooks and Mac Book Pros, Speck's SeeThru can give you a red MacBook Pro, and smcFanControl lets you manage the fan in your MacBook or MacBook Pro. "After Friday's launch of the (PRODUCT) RED iPod nano to benefit The Global Fund to Fight AIDS, Tuberculosis and Malaria, there are some rumblings that Apple may extend the program to include other products as well. "If you like red, you may want to consider the new SeeThru hard shell for the 15" MacBook Pro (US$40) from Speck Products instead. SeeThru MacBook Pro cases are made of translucent hard plastic and come in either clear or red - although not that (RED). Then you can donate some money to the AIDS charity of your choice to show your support - and you can remove the red shell if it gives you a headache." "A report by Bloomberg's Tim Culpan paints a pretty grim picture of notebook battery availability until at least next summer. The culprit? 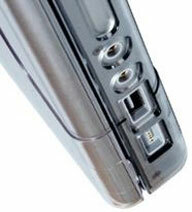 The recall of over 8 million notebook batteries in recent months." "Now, it's well known that Apple laptops run hotter than many other models. They have for some time, presumably in a bid to reduce fan noise. I use a MacBook Pro and have done since I upgraded from a 12in PowerBook G4 in May this year. "Yes, it gets hot. But no, it's never caused me any pain, let alone any marks. I like to think that if it got hot enough to do so, I'd leave the thing alone." "Quanta Computer has started test production for the US$100 notebook project initiated by the One Laptop per Child (OLPC) research initiative, and samples should be available as early as November, according to sources within Taiwan's IC design sector." "The government of Libya is reported to have agreed to provide its 1.2m school children with a cheap durable laptop computer by June 2008. "The laptops offer Internet access and are powered by a wind-up crank. They cost $100 and manufacturing begins next year, says One Laptop per Child. "The nonprofit association's chairman, Nicholas Negroponte, said the deal was reached on Tuesday in Libya." "If the plan is perfectly executed, Nicholas Negroponte's One Laptop Per Child project will deploy 100 million laptops in the first year. In one fell swoop, the nonprofit organization will create the largest computing monoculture in history. "Wary of the security risks associated with a computing monoculture - millions of machines with hardware and software of identical design - OLPC foundation officials are seeking help from the world's best hackers to review the full specifications of the $100 laptop's security model." Link: How Do You Secure 100 Million Laptops? "The 15.4-inch widescreen segment is expected to grab 39% of the notebook panel market in 2006, followed by 14.1-inch widescreen's 17%, said the research firm. The 15.4-inch segment is likely to rise to account for 47% of the notebook panel market in 2010, indicated the research firm." PR: Acer, Sponsor of Scuderia Ferrari and one of the leading worldwide suppliers of IT solutions, today announced the North American availability of the new Ferrari 1000 and Ferrari 5000 series, a family of Acer notebooks engineered to combine state-of-the-art performance, modern design and supreme reliability. The Ferrari 1000 and Ferrari 5000 are the world's first notebook series offering the exclusive and cutting-edge technology pioneered and perfected in the world of Formula One racing. The carbon-fiber casing of the Ferrari 1000 and Ferrari 5000 conceal the very latest dual-core technology, highlighting a notebook that offers all the performance and elegance gained from the alliance between two companies constantly focused on innovation and renowned for pushing the boundaries of technology. "After almost three years of partnership and successful and innovative notebooks such as the Ferrari 4000 and 3400," says Gianfranco Lanci, President of Acer Inc, "Acer has designed a truly exclusive notebook range that expresses our firm intention to stay at the forefront of innovation, an ambition that has always characterized both the worlds of Formula One and information technology." "Technology is essential to achieve objectives," says Jean Todt, General Manager of Scuderia Ferrari. "We believe that innovation leads to constant evolution, and we are delighted that one of our Sponsors places such importance on the research and development of advanced technological solutions." 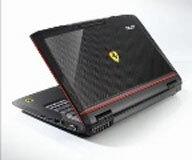 The Ferrari 1000 and Ferrari 5000 are based on the latest AMD Turion™ 64 X2 Mobile Technology. Harnessing the natural power of the latest dual-core technology, the new Acer systems deliver added performance with intelligent power management features. In addition, the new 64-bit architecture delivers leading-edge power and provides a taste of the performance gains promised by future 64-bit applications. Ideal for those design conscious professional users who desire compactness and performance, the Ferrari 1000 adds style and distinction to everyday mobility. Powered with an AMD Turion™ 64 X2 processor, the Ferrari 1000 delivers the performance for users who want an ultramobile notebook with long battery life. The 12.1" Acer CrystalBrite™ widescreen display presents stunning visuals thanks to ATI RADEON XPRESS 1150 chipset supporting up to 512 MB Hypermemory. The Ferrari 1000 redefines the shape of mobile perfection, with modern design and versatility. In less than four pounds, the notebook boasts superior performance and seamless wireless and wired communication in any environment. The Ferrari 1000 delivers WiFi connectivity via integrated Broadcom's Intensi-fi draft-802.11n wireless chipsets and Blutonium Bluetooth 2.0 wireless technologies, providing users with the speed and reliability to handle the most intense applications on a WiFi network, including new voice, video, gaming and music applications. The Ferrari 1000 also features the Acer OrbiCam™, a 1.3 megapixel web camera positioned on top of the LCD panel allowing users real-time, face-to-face communication. Crafted with a thin and light carbon fiber casing - styled in black and in the exclusive "Ferrari red" - this innovative notebook is equipped to be the technology leader in 15.4" desktop replacement segment. Powered by the AMD Turion 64 X2 processor, the Ferrari 5000 delivers the best power output for heavy-application users seeking for a notebook to keep pace with today's data processing needs. For communications, the Ferrari 5000 is bundled with the handy Acer Bluetooth® VoIP phone, and offers visual communication with Acer Video Conference solution and Acer OrbiCam web camera. The notebook comes complete with WLAN (with Acer InviLink 802.11a/b/g WiFi CERTIFIED solution, supporting Acer SignalUp™ wireless technology), WPAN with built-in Bluetooth 2.0 module, LAN connection with Gigabit Ethernet cards and standard connectivity through the integrated 56K ITU V.92 modem. The Ferrari 5000 offers up to 160 GB Hard Disk Drive (HDD) and a slot-loading DVD-Super Multi double-layer drive. In addition, a five-in-one card-reader can be utilized for an optional MultiMediaCard, Secure Digital card, Memory Stick®, Memory Stick PRO™or xD-Picture Card™. Both the Ferrari 1000 and Ferrari 5000 notebooks can be efficiently managed with Acer Empowering Technology, an intuitive interface that gives users easy control over their notebook's security, performance, settings and communication with a single touch of the Empowering Key. Both Ferrari series come with Microsoft Windows® XP Professional preinstalled. Additional installed software includes Adobe Reader, Norton AntiVirus and CyberLink PowerDVD and Acer GridVista software suite. The Acer Ferrari family of notebooks come with a standard one-year parts and labor warranty, which includes concurrent International Traveler's Coverage that can be extended to three years with the Acer Advantage service that also covers accidental damage to the notebook. Additionally, all Acer notebooks are backed by toll-free service and support. Online support is available at www.acersupport.com. The Ferrari 1000 and 5000 notebooks are available through Acer authorized resellers throughout North America with prices starting at $1999 and $2299, respectively. "Some key combinations that may work on standard keyboards may not be recognized on Apple's portable computers. This includes combinations containing more than four keys and some combinations of three keys across the home row (asdfghjkl;')." "If you require the use of combinations that are not possible with the Apple portable computers' built-in keyboard, you can connect an external keyboard to the computer." PR: The new MCE OptiBay Hard Drive was created for those users who need as much hard drive space as possible inside their MacBook Pro or PowerBook G4. Period. The MCE OptiBay Hard Drive replaces your internal SuperDrive or Combo drive with a high performance hard drive resulting in unheard of capacities in laptop hard drive space for all your projects . . . digital video, music, photos, etc. Two bootable hard drives inside your system open up a whole world of freedom and flexibility never before experienced in a Mac laptop . . . Scratch disk/System disk, RAID configurations, "System-dedicated" drives, and more. Plus, each OptiBay Hard Drive includes a portable FireWire enclosure for your SuperDrive or Combo drive so you'll still be able to use it anytime you want for loading system software or applications, as well as burning, playing, or ripping CDs and DVDs. MCE Technologies is again breaking ground with the new MCE OptiBay Hard Drive. MCE has designed and engineered hard drive and SuperDrive upgrades for PowerBooks since the mid-1990s. 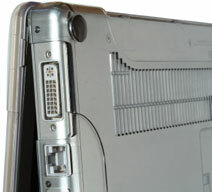 Those PowerBooks used to have what was called an "Expansion Bay" slot giving users a tremendous amount of flexibility in how they use their machines. We created "Expansion Bay Hard Drives" for those machines, (still available today), allowing users to easily replace their expansion bay optical drives with a removable hard drive. Apple's introduction of the PowerBook G4 in 2001 and their quest for the thinnest notebook in the world eliminated the possibility for an expansion bay slot and users have been stuck with a built-in optical drive ever since. While we have been busily shipping SuperDrive upgrades for the PowerBook G4 for many years we've continued to hear from customers yearning for the old days when the optical drive was removable so they can put a hard drive in its place. We've also found many users out there doing high end HD and DV editing with Final Cut Pro and for whom an abundance of hard drive space is an absolute necessity . . . more necessary than having a built-in optical drive. For all those users and for users who simply want more hard drive space inside their MacBook Pro or PowerBook G4 for their music, video, and photo libraries we've invented the OptiBay Hard Drive. Take out your SuperDrive and put in an OptiBay Hard Drive and give yourself up to an extra 160 GB of high performance hard drive space to use however you'd like. Combine it with a 160 GB internal hard drive and find out what a dream it is to have 320 GB of hard drive space inside your laptop. The MCE OptiBay Hard Drive is a high performance laptop hard drive in a specially designed, lightweight case that's been engineered to the exact same dimensions as your laptop's SuperDrive or Combo drive. We made the case so lightweight, in fact, that, in most instances, replacing your optical drive with an MCE OptiBay Hard Drive actually shaves a quarter pound off the overall weight of your MacBook Pro or PowerBook G4! Besides just appearing different, laptop optical drives and hard drives have very different data connectors, as well, so an adapter was developed so the hard drive can communicate with your MacBook Pro or PowerBook G4 through the optical drive connector on the motherboard. Since they already speak the same language, ATA, not one bit of speed or performance is lost in adapting the drive's connector. Speaking of communications, your Mac won't even mind that the OptiBay Hard Drive is now connected to its optical drive connector. It recognizes it as just another hard drive connected to its ATA bus and communicates with it just as it would any other hard drive. Remember, you have a Mac where stuff just works! You even use Apple's own Disk Utility program to easily setup and partition the OptiBay Hard Drive however you'd like . . . as a standard hard drive volume showing up as its own icon on your desktop, in conjunction with your internal hard drive as part of a RAID 0 (Striped) or RAID 1 (Mirrored) array, or concatenated (combined) with your internal hard drive so they appear as one large hard drive are just a few of the many possibilities. The MCE OptiBay Hard Drive can be used as a scratch disk for your data, doing all the heavy work and not bogged down trying to run system routines simultaneously. Since the MCE OptiBay Hard Drive is bootable and for extra security, you could setup one drive as a Mac OS drive and the other as a dedicated Windows XP drive on MacBook Pros. The MCE OptiBay Hard Drive responds to SMART status commands from the Mac OS. SMART status commands query a drive's internal reliability algorithms and can, therefore, warn of possible impending disk failure long before it happens giving you enough time to archive your data before it's lost. In addition, the MCE OptiBay Hard Drive falls within the heat and power dissipation specification for the optical drive it is replacing and also has built-in power management routines which allow it to use even less power. Depending on the spindle speed of the drive, battery life between charges with an OptiBay Hard Drive installed is affected by only 10 to 15%. The Mac OS will even spin the OptiBay Hard Drive down when not in use if instructed to do so in the Energy Saver preference panel within System Preferences. Included with the MCE OptiBay Hard Drive solution is a portable, FireWire enclosure for the SuperDrive or Combo drive removed from your machine. The MCE FireWire enclosure turns your optical drive into a slim, portable, bootable, bus-powered FireWire SuperDrive or Combo drive just as compatible with iTunes, iDVD, Finder Burning, as before. Now just plug in the FireWire SuperDrive or Combo drive to your FireWire port only when needed in order to play, burn, or rip CDs or DVDs or to load new system software or applications. You can also use it on ANY Mac or PC with a FireWire port! You may install it yourself* or, if you prefer, you may have the MCE OptiBay Hard Drive professionally installed into your MacBook Pro or PowerBook G4 by MCE Technologies or one of our worldwide Authorized Upgrade Centers. *Note for 12" PowerBook G4 Owners: We highly recommend that your drive be professionally installed. The installation of the MCE OptiBay Hard drive into the 12" PowerBook G4 involves the removal of some 40 plus screws and parts and is not for the faint of heart. Only an experienced technician should attempt this upgrade into the 12" PowerBook G4. MacBook Pro (15" or 17") running Mac OS X 10.4.x or later. Full Disc Burning compatibility with FireWire enclosure requires Mac OS X 10.4 or later. PowerBook G4 15" Titanium DVD-ROM only drive not compatible with FireWire Enclosure. PR: FastMac has announced the first & only high capacity, extended life battery upgrade for Apple's 15" MacBook Pro computer. The new 62 Whr battery uses Lithium-Polymer cells (with integrated charge indicator LEDs) that are manufactured to the highest quality standards and utilize TruePower technology to provide a safe computing experience. FastMac's TruePower battery for the 15" MacBook Pro is scheduled to ship within 10 days and is available for preorder from FastMac for a special introductory price of $99.95. Each battery carries a 1 year warranty and a 30 day money back guarantee. "As a replacement, or a spare, our battery not only lasts longer but is $30 cheaper than any other MacBook Pro battery," said Michael Lowdermilk, Business Development Manager for FastMac Performance Upgrades, Inc. "This new battery furthers our mission strategy of providing the Mac user with better products with better technology at a better price." FastMac's use of TruePower technology has attracted a lot of interest in other potential uses and applications. FastMac is working with 2 ODMs to incorporate this technology into digital cameras and smart phones, such as the Palm Handspring Treo and RIM Blackberry. PR: Speck has announced that it has invented a new accessories category for notebook computers, believed to be the first translucent hard shell design for computers in the market. SeeThru hard shells for the MacBook Pro 15" notebook start shipping immediately. SeeThru hard shells for MacBook and MacBook Pro are made of sturdy, polycarbonate plastic and come in clear and red colors. Keep your 15" MacBook Pro closed when you put on the case. Place MacBook Pro in bottom half of case, snap on the corners and back "hooks". Place top half of the case on top of MacBook Pro, snap on corners. Pull the small tabs away from the MacBook Pro corners to remove the case. Open the MacBook Pro and pull off the front corners first , then pop off the back. PR: Small Tree Communications, an industry leader in networking and storage solutions, announces the introduction of the first Gigabit Ethernet 34mm ExpressCard for the Apple MacBook Pro. The Small Tree PEG34m offers high-performance Gigabit connectivity at an attractive price point - $79 - and is specifically designed to plug into a MacBook Pro (plus other Windows desktop or laptop systems) equipped with an ExpressCard 34mm slot. The PEG34m provides throughput and connectivity at speeds up to 100 times faster than the original Ethernet. The PEG34m, which has a unique foldable RJ-45 connector, is the thinnest ExpressCard on the market today, making it easy and convenient to carry and store. The PEG34m provides MacBook Pro owners with a second fully functional Gigabit network for applications such as large file transfer and sharing. Working in conjunction with the computer's built-in Gigabit Ethernet port the PEG34m supports 802.3ad link aggregation and Jumbo frames up to 9000MTU. "Small Tree's PEG34m is a highly affordable solution capitalizing on the broad appeal of Ethernet technology," states Corky Seeber, president of Small Tree Communications. "We are specifically targeting the PEG34m at the personal, small office/home office buyer, allowing them to obtain additional Gigabit Ethernet connectivity and performance without cost being an issue." PR: Control the MacBook or MacBook Pro fans to make it run cooler. FanControl lets the user set the minimum speed of the build in fans. So you can increase your minimum fan speed to make your MacBook run cooler. However in order not to damage your machine FanControl let's you not set minimum speed to a rate under Apple's defaults. To change fan-speeds you need to authenticate with valid credentials of an user-account with admin privileges. If you want to auto-apply your changed settings after a restart, check the "auto apply after launch" checkbox and add smcFanControl to your Login Items. In order not to lose your changed settings after standby, run smcFanControl in the background. Let's you set the minimum speed for each fan individually. Info: On MacBook Pros the speed of fan #2 can not be set under the speed of fan #1. This behaviour seems to be due a setting in SMC controller. I can not change it. System requirements: MacBook or MacBook Pro, Mac OS X 10.4 or later. PR: ThermoInDock displays graphs of the internal thermal sensors on your Mac in the Dock. ThermoInDock displays graphs of the internal thermal sensors on your Mac in the Dock. It also supports the modules to change the appearance of Dock icon. The current version of ThermoInDock won't work on some models of PowerMacs and PowerBooks due to lack of thermal sensor on their CPUs. The following list shows the supported and unsupported models reported. The other models not listed here have not yet confirmed. Aluminum PowerBook G4s, Power Mac G5, and Intel-based Macs. Unsupported models: Any models that ThermoInDock quits immediately after the startup. Added support for Power Mac G5 and Intel-based Macs. PR: Lilt, a unique tool for Mac OS X and Macintosh machines that feature light and/or sudden motion sensors, has been pre-released to the public. Lilt utilizes the ambient light and sudden motion sensors found on recent Apple Macintosh portable computers to trigger actions such as launching applications, files, or scripts. By launching a script Lilt can do some amazing things. Wave your hand over the light sensors (located under the speaker grills) and play your next iTunes track. Tilt the computer back and hear the time spoken to you. The possibilities are endless. This prerelease version of Lilt is being offered to the general public without any restrictions except that it will cease to function after October 31, 2006. When Lilt is formally released, it will be fully functional shareware for sale for $5. Since this is a prerelease version, there may be imperfections or faults in the software. It is being released to the public to try and iron out any bugs that it may contain before the shareware version is released. This prerelease version is free to use but will cease to function after October 31, 2006. When the application is formally released, the fee will be $5. PR: A program which interprets movement of the Notebook - e.g. impacts on it - to step up on the next song into iTunes. Skip checker is an advancement of the old SkipTunes, which functioned only for the operation of iTunes on iBooks and PowerBooks. Portable Mac with a Sudden Motion Sensor.